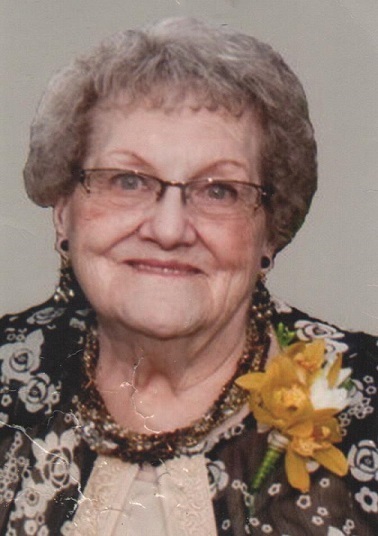 Alva E. Shoenrock, age 91, of Sioux Falls, formerly of Madison and Dell Rapids, died Wednesday, September 19, 2018, at Good Samaritan Village, Sioux Falls. Funeral Services will be 11:00 AM, Monday, September 24, 2018 at First Presbyterian Church with burial at Graceland Cemetery. The family will be present for visitation 5-7 PM Sunday evening with a Prayer Service at 7 PM at Ellsworth Funeral Home. Alva Evelyn Shoemaker was born October 23, 1926, to Lawrence and Lucille (White) Shoemaker, at Winfred, SD. She graduated from Madison High School in 1945. Alva married Charles Shoenrock on December 23, 1946, at Luverne, MN. They ran Shoenrock Plumbing and Heating in Madison for 30 years. Alva was a long-time employee of Pamida and a member of First Presbyterian Church. Alva was preceded in death by her parents; her husband in 2002, one son Charles, Jr.; a brother Cleo Shoemaker; sisters Naomi Unzelman, Dorothy Shoemaker and an infant sister Ula; and a great grandson Colton Shoenrock. Survivors include two sons, Rocky (Donna) Shoenrock of Madison and Donnie Shoenrock of Coffeyville, OK; two daughters, Trudy (Mark) Hauge of Dell Rapids and Marlene (Sonny) Abbott of Seattle, WA; one daughter-in-law Rose Shoenrock of Colman; 15 grandchildren; 38 great grandchildren; and nine great-great grandchildren.